In a picture perfect World we’d open the freezer on a busy weeknight to find a neatly stacked stockpile of homemade dinners. All prepped, packed, labelled and ready to heat and eat. Reality is a LOT different. It’s 5.05pm, breakfast dishes are still in the sink, kids are grumpy-hungry and half the ingredients you need for tonight’s dinner are MIA (thanks to kids random snacking habits). Dinner time stress can be a major reason I find myself eyeing out that Whisky bottle long before the official Wine-O-Clock time, which btw, according to a recent survey is 6.59pm. Hmmm. I’m thinking there weren’t many Moms included in the survey. There are only THREE OPTIONS when it comes to getting on top of the whole Dinner time dilemma. The first is having a full time live in chef (and if this is you, well, I’m jealous). The second is to order takeout every night. And let’s face it, this is not good for our health, waistline of wallet. The final option involves learning how to Meal Prep. 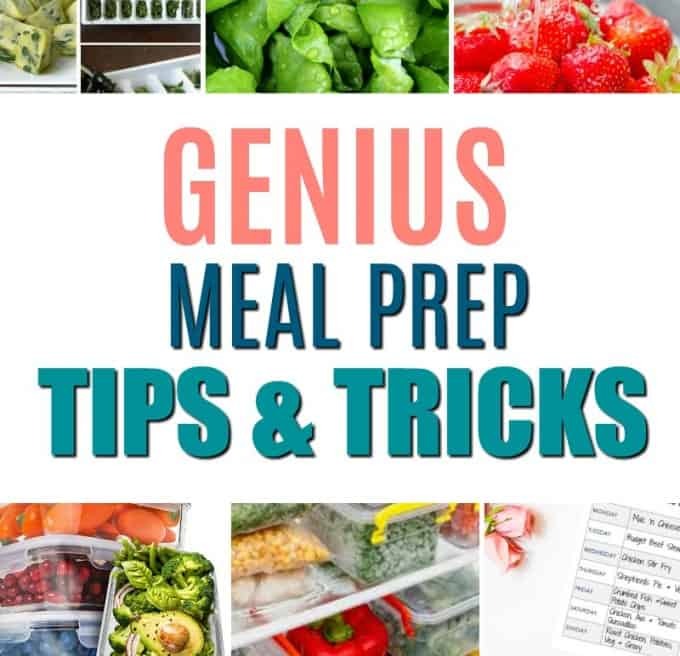 Now before you start to Google the number for your local takeout, take a minute to read through these Mom Meal prepping hacks, because they are guaranteed make Dinner time a whole lot easier. For next time. 1. Invest in good quality food containers. The ones I recommend are the type that you can see through. Pick the glass or plastic options, but make sure you can see what food is stored inside. These containers made a massive difference in our home not only by keeping food fresher for longer, but it reduced waste and made leftovers way more appealing. 2. Freeze leftovers in portion sizes. If you don’t plan on eating that lasagna again tomorrow night, simply cut it into individual portion sizes, wrap in aluminium foil and freeze. Most of the time we don’t freeze leftovers because it’s not enough for a full family meal. Two days later the uneaten food gets tossed. Having portion sized meals in the freezer are really handy. 3. The 10 Minute Dinner Plan. This little job can take less than 10 minutes a week, but saves a lot of stress. Write down SEVEN dinners you plan on eating this week. Get each family member to pick one or two dinners to make it easier. You can get my free One Page Dinner Planner here. 4. Sheet Pan Meals Rock! There is nothing easier than tossing meat, potatoes and veggies onto a tray and roasting. 5 minutes of prep work and ‘Voila!’, dinner is in the oven! 5. Use your Crockpot at least once a week. Crockpots are back in fashion baby! Dump your ingredients in the pot before work and come home to a delicious (almost) done for you soup or casserole. 6. Cook once, eat twice. Double up on some recipes and freeze the extra batch. The best recipe to start with is Bolognese Sauce. It’s a really versatile sauce that can literally be used in hundreds of recipes. 7. Foil Packet Dinners are flippin’ amazing! Individually wrapped portions that you can prep ahead and bake in the oven or cook on the barbecue. Get the kids involved with this one and try one of these yummy Foil Packet Dinners this week. 8. Roast a chicken for the fridge. This is still the best meal prep hack. Roast a chicken, let it cool and shred the meat. Store in an airtight container in the fridge. Shredded chicken is great for salads, sandwiches, wraps, stir fries and noodles. Bread a little crusty and stale to eat? No problem, turn the oven to 150.C/300F and wrap the stale bread in a damp kitchen towel or moist paper lunch wrap. Heat for 3 to 5 minutes. The steam will do it’s work and your bread will feel and taste like it was baked today. 10. Freeze leftover fresh herbs in butter. Don’t let those expensive fresh herbs wither on the kitchen windowsill. Rather save them for later by chopping them up, popping them in an ice cube tray, top with olive oil or melted butter and freeze. To use, just add to a hot pan until the oil cooks down. Individual flavor bombs ready when you need them. 11. Extend the life of your lettuce. Store your lettuce in an airtight mason jar to keep it fresh for a week or more longer. 12. Wash berries in vinegar to make them last longer. You can extend the life of fresh berries and grapes by giving them a bath in 1 cup of vinegar and 3 cups of water before you put them in the fridge. This clever little trick kills any mold spores and bacteria that speed up the decay process. Wash, chop and prep your vegetables the day you bring them home from the store. This means no more food waste or throwing out wilted fruit and vegetables at the end of every week. If you don’t think that you’ll get through the giant bunch of spinach you bought on sale, then wash, chop and freeze for another day. I like to freeze my fruit and veg in family sized portions so it’s simply a case of grabbing a bag and thawing. It cuts a load of time off dinner prep. 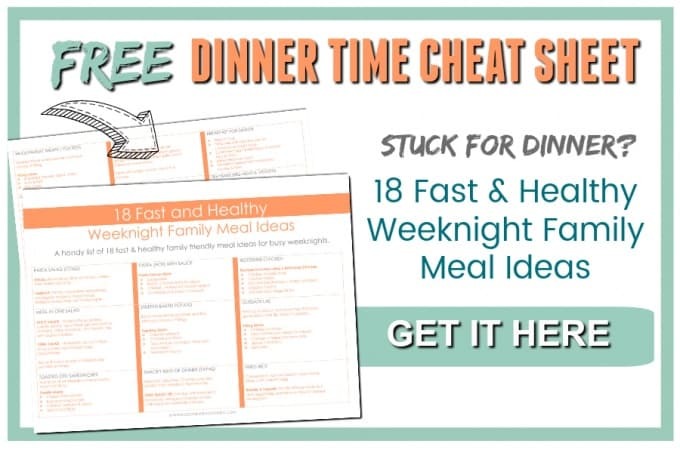 Check the family schedule before planning your meals for the week. If you know you’re going to be home late 3 nights this week, then plan ahead for fast meal options. Don’t stock up with a fridge full of fresh veggies if you know you’re not going to be around to eat them. –>> Want to access ALL of my Printables for Free? Get ALL my CEWK printables here. Not all kitchen tools are created equal. Some kitchen bits and bobs seem a great idea when you buy them but then sit gathering dust and taking up space in your kitchen cabinets. If a kitchen gadget doesn’t save you time and money then ask yourself if it’s really earning it’s keep – if not, it’s time to throw it out. Some kitchen appliances are worth every cent you spend on them. Put together a list of all your family favorite recipes. This is a handy reference you will build up over time and you will never be stuck with the ‘what should I make for dinner’ thing again. 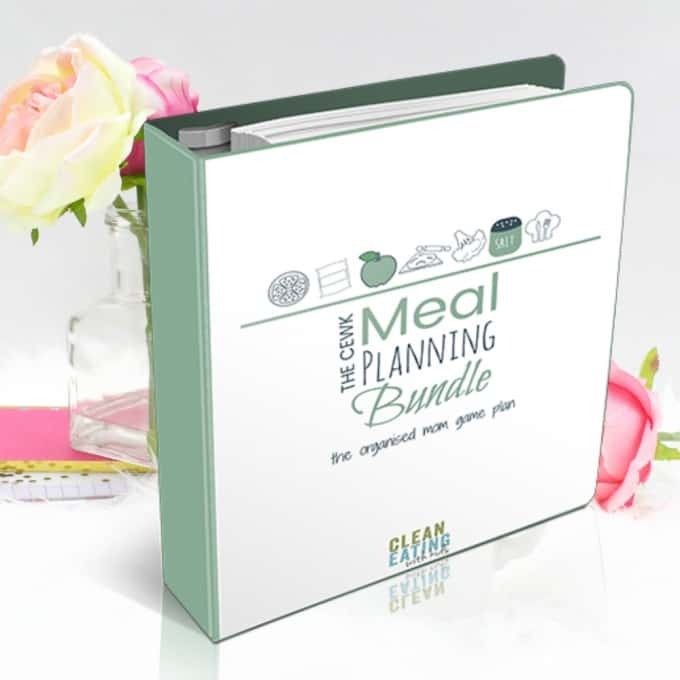 Rather than starting your meal planning from scratch every week, keep your past meal plans in a binder and rotate. You only need five or six weeks of meal plans in total. There is no harm in reusing a meal plan every few weeks. The family won’t even notice. Never underestimate the value of a good Kitchen Binder. It’s a catch all binder for everything food and kitchen related. It’s an all in one place to store recipes, meal plans, coupons, cooking tips etc. Theme nights make meal planning that little easier. Pasta Sunday, Taco Tuesday or Pizza Friday. Knowing what to make each day of the week simplifies meal prepping. And the kids love it too! This recipe is a game changer! Seriously it is by far the most popular recipe on my blog and for a good reason. Memorize and keep this two ingredient pizza dough up your sleeve for an easy, super fast homemade pizza dinner. Just top with pasta sauce, whatever you have in the fridge and a little grated cheese. Smoothies are THE best way to get your kids (yup, even the fussy ones) to eat drink a nutritious breakfast before school. You can make them ahead, bag and freeze. Even on the busiest mornings you can throw some fruit and oats into a NutriBullet . If we are in a hurry, the kids sip them in the car on the way to school. You don’t have to buy everything from scratch. There are loads of convenience foods that fit into a healthy diet. Just remember to read the ingredients before popping them into your trolley. Make life that much easier by stocking up on frozen veggies, canned beans, bottled pasta and premixed spices.